Links in the REFERENCES and NOTES sections of this book have been copied here for quick access, as well as some key FIGURES. New inputs and ideas from readers are posted below as well; some of these may be citations in the next edition. Thanks for all the interest, the feedback is outstanding. CDNA Slideshare (PDF) – summary of the key points in the book, including the Reader’s Guide, and links to both Amazon and this site; forward this to others if you think they’d have an interest; also available on LinkedIn. FIGURE 24, Chapter 16 – Collaborative Workspace Requirements (PDF) – some key gaps in current Collaboration Platform software. Jones, Chris. “Words That Matter: Wittgenstein & Lakoff” (2011), inputs to Ch. 5 & 6. Siemens, George. “Connectivism” (Rhizomatic Learning) in International Journal of Instructional Technology. 09. 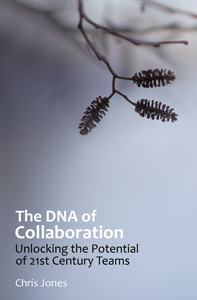 “On Cultures of Learning” (2009) A great example of virtual collaboration in action; my then acquaintance and now friend Christian DeNeef (@cdn) introduced me to Peter Senge and the 5th Discipline as a comment to this post; Senge’s work is both foundation and scaffolding for The DNA of Collaboration. SMCHAT Possibilities of Social Media in 140c WEDS 1p EDT (weekly); note, this chat recently posted #9 in terms of overall SocialMedia/PR twitter chat volume for the week measured in May 2012, as reported by Social Fresh. 40. Mind Maps courtesy Chuck Frey. 50. Charter Schools on U.S. News and World Report. 146. PMI PMBOK Standardsa benchmark for process and structure. 150. ECOSYS Wiki an example of a virtual collaboration work space. 152. OGD Workshop No. 4, Team 3 Wiki an example of f2f collaboration using a process similar to the one I’ve outlined here. NEW FOR CDNA 2nd Edition!